are we all back into the swing of things ? All the decorations have been taken down .. all the glitz and glitter now a memory past ... reality hits ... its a cold wet January. Thinking what a waste to just put the pretty cards in the recycling bin .... 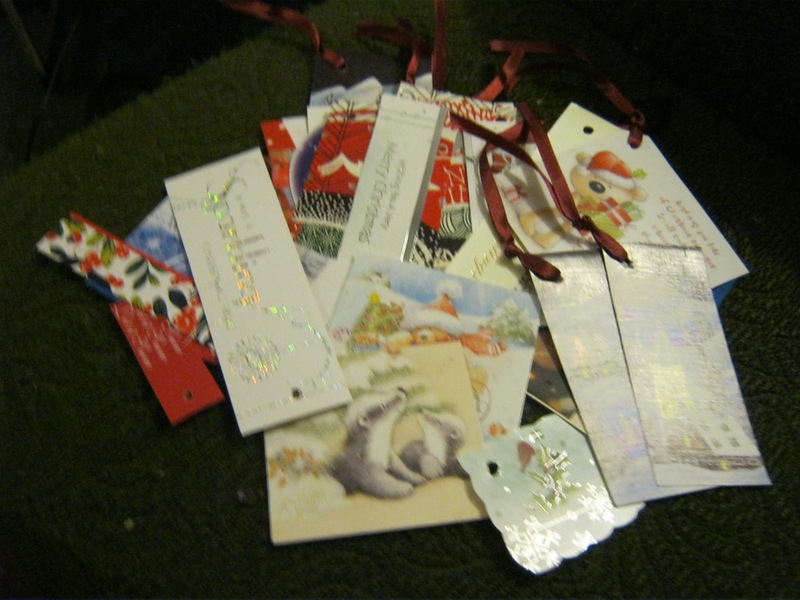 I cut them into gift tags. I found some oddments of ribbon to string them ... all ready to be used next year.... and no doubt next Christmas will come all too soon. 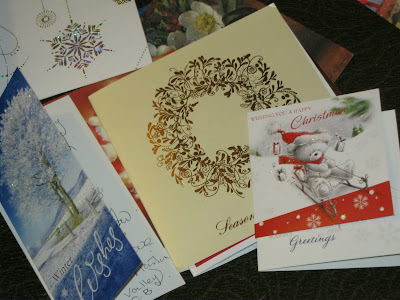 Moving on from the festive season .. it must seem a long time for some until payday ... money is always in short supply. Hubby P and I had a sit down and a good old chat about our finances and areas we are going to try and improve on ... saving where we can .. shaving off a penny here and there. Shopping was one ... I don't know about you but the cost seems to being going up and up. We decided to make more effort checking prices across the shops available to us .... time consuming .. but we must just fit it into our life. Lidl was our choice this week ... to see what bargains they had to offer. 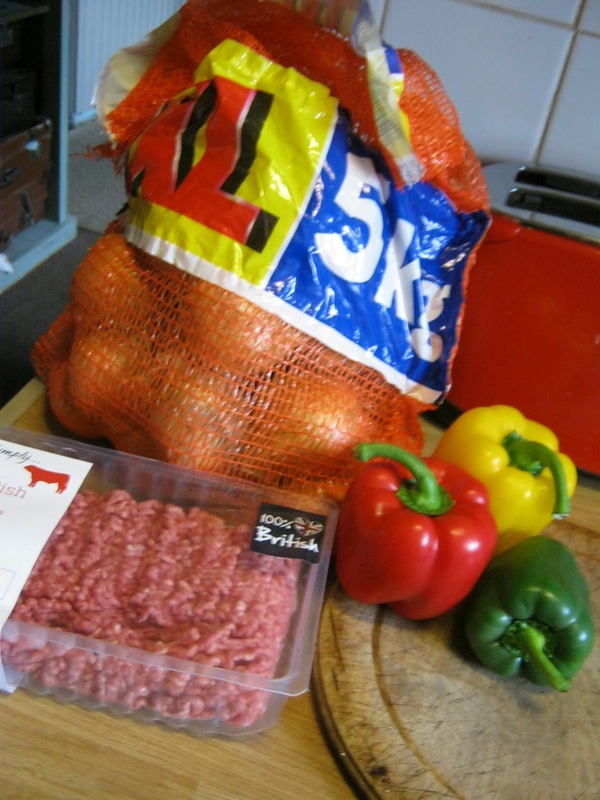 Our haul included onions... great big bag full 5kgs for £1.99. A lot of onions! but they keep well and if they show signs of getting a bit tired I will chop and freeze them ... but we eat a lot of onions ... onions are good for you! 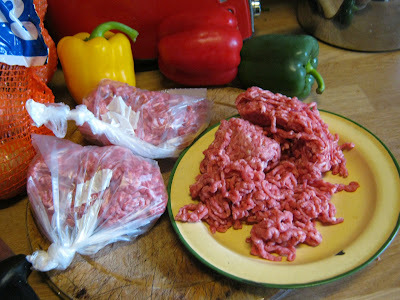 British beef mince 800 gms .... that's enough for three good meals for £2.49. I divided it into three packs and put two in the freezer ... we had Shepherds Pie for tea ... made with the last portion .. it was very nice ... very lean mince. 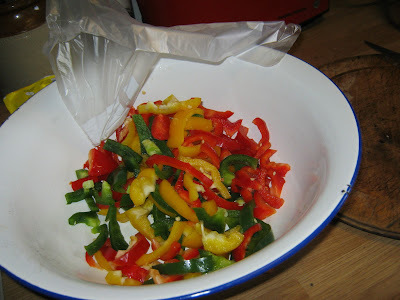 Peppers .... nice and fresh were on offer .. three for 89p. I chopped them and popped them in the freezer .... I mostly use them in stir fry type meals. 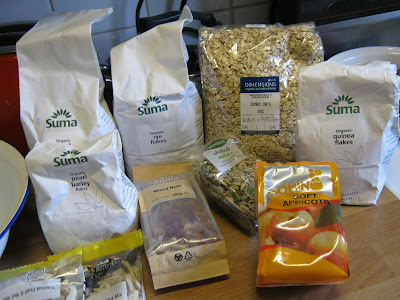 As part of a Christmas treat I bought some nice grains to make my muesli ... just love this yummy stuff for breakfast. the shopkeeper must have had the patience of a saint. Anyway enough .... I'm off to do more bargain huntin ... I think we all will be on the same trail if we are to survive these constant price hikes. So whats your bargain of the week ... do tell .. we need to share and pull together. 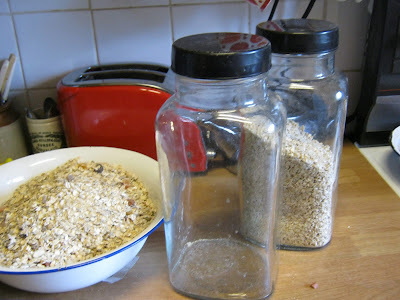 I've wanted to make my own muesli. Did you get the rye flakes etc from Lidl? There is a new sweet shop in Cornwall that has the old style big jars of stuff lining the walls! :) It's cute. I love peppers in just about anything! They're good in chilli and fajitas, also I made a quiche with them in the other day. The ribbon was a nice touch to your new Christmas labels! Hi Mum ...I got the sunflower and pumpkin seeds & apricots from Lidl. The rest I got from a (not so cheap) Health Food type shop. I'm trying not to eat so much wheat, so there are oats rye pearl barley and quinoa flakes, but of course you can use anything really .. I ring the changes with chopped prunes, sultanas, various nuts etc. I would be interested to know if anyone knows where to get reasonably priced Wholefoods ... if there is such a place! You have made great choices. What is murseli? I've found Lidl's white bread flour makes lovely bread in my breadmaker. I buy my grains at Holland and Barrett. Around £1.25 for 500g of rye flakes or barley flakes. I use them in my breadmaking and they seem to last for ages.I got linseeds cheap from Approved Foods a while ago. Your onions were a good buy. We've used all those we grew so I will get some from Lidl - thanks for mentioning them. prices are sky rocketing here as well, you and cook so much alike.I would have done the same thing with the mince only here in Canada we call it hamburger which is stupid because its not a burger is it!Your muesli looks like it must have been wonderfful! I did'nt realise until this week how many vegetables can be frozen from fresh to add into various meals! Keep up with the thrifty meals! hi Vicky- yes you're quite right about the eggs! Nice. Thanks for sharing your experience. 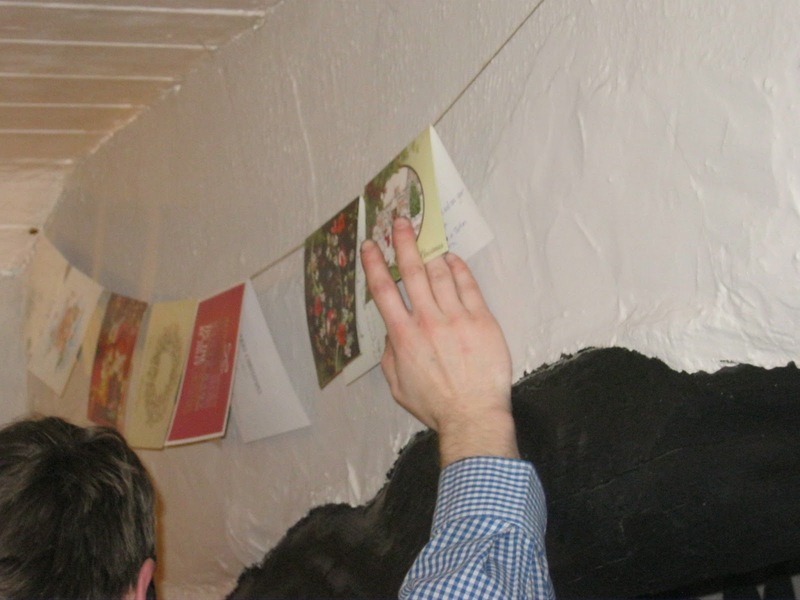 I wish to spend beautiful anglesey cottage holidays too. great bargains. i love peppers too. how do you freeze the onions? here in germany cost 5kg onions 1,99 euro.